The Pink Purse of Peruvian lilies also contains pink roses and pink carnations. Ella Fitzgerald lived in Yonkers New York at one time. I created this bouquet of dried spray roses in honor of her birthday which was on April 25. May her music always live on! What's your favorite Ella tune? I was in the flower district one Monday morning looking for inspiration for my weekly accounts. I was amazed to see how many different shades of purple there are. From the palest lavender to the deepest amethyst. I decided to create a study in purple that week and came up with this floral arrangement. What's your favorite shade of purple? Hot pink roses, Queen Anne's lace , green pom poms, pink boronia, white mums and green hypericum and lemon leaf comprise this elegant spring arrangement. Your flower arrangement will be carefully wrapped in coordinating tissue and ribbon. Let us create a beautiful, custom Spring Flower Easter Basket for you! 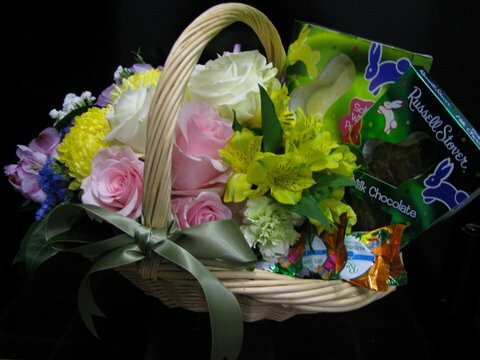 We create custom Easter Baskets including our most beautiful flowers and lots of sweets!